At Curtin assessment is considered an integral element of the students' learning experience. 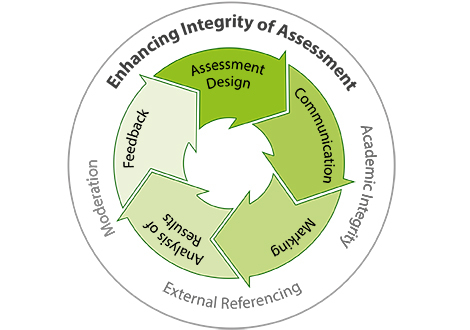 The assessment model illustrates the workflow around assessment comprises five interrelated events, all underpinned by practices to enhance the quality and integrity of assessment. The assessment model is informed by Curtin's ten principles of effective assessment practice, as documented in section 3.1 of the Assessment and Student Progression Manual. Designing quality assessment tasks involves multiple considerations if it is to be fit for purpose. The suite of assessments in a unit should be planned to provide students with the opportunity to learn as they engage with formative tasks as well as the opportunity to demonstrate their learning through summative tasks. There is a range of assessment formats in current use and others emerging as eTechnologies provides different possibilities. Energising the learner through the use of realistic, authentic experiences is an exciting challenge for the unit teaching team, who are responsible for the review and quality enhancements to assessments practices. Communication occurs throughout the assessment workflow phases, however in the communication phase the communication of assessment requirements to students and the teaching team is stressed. Students should be made aware of assessment practices undertaken in the unit, for example plagiarism detection and management procedures, marking rubrics and moderation practices. Marking practices are probably considered one of the challenging aspects of academic work. Efficiency and effectiveness in marking processes are needed; the use of hardcopy or electronic marking guides/rubrics can help as well as eTechnologies. Marking is not just about providing a mark or grade to the student. For example, techniques to involve students and peers in the marking process can assist students to understand the assessment task and inform further learning. Before marks are released to students the results from marking should be explored. Consistency in marking across a marking team is imperative and any statistical analysis performed at this stage to determine the distribution of scores is an important moderation process. Feedback is an integral element of the learning processes. It should aim to be informative and analytical, supportive and constructive and formative. It should not only provide information to students on how they have performed in the assessment task and towards achieving the learning outcomes, but also provide advice to improve their learning and future performances (known as formative or feed-forward feedback). The challenge for the educator is to provide this information regularly, in a timely fashion and keep the feedback process manageable. Moderation concerns quality assurance processes to ensure that every student receives fair treatment with regard to assessment processes. Pre, intra and post-marking strategies should be considered to ensure equitable arrangements are in place for all students, irrespective of their study location or mode of study. Moderation processes are particularly important to have in place in units with large student cohorts and where multiple markers are involved. Academic integrity is essential to the foundation and ongoing viability of an academic community. It involves a commitment to fundamental values such as honesty, trust, fairness, respect and responsibility in academia. As a place of learning and research, Curtin needs the ideals of academic integrity to be upheld and communicated to students throughout the duration of their course of study. If students understand and behave in accordance with the principles underpinning academic integrity, issues of plagiarism arising from lack of knowledge are likely to be fewer. The University provides resources for students and teaching staff to assist in the developing of skills related to academic integrity.